U.S. Sends Limited Troops To Niger; Will Assist In Intelligence-Gathering : The Two-Way About 100 U.S. troops will help France gather information on Islamist fighters in neighboring Mali, many of whom escaped from French troops who've retaken towns from the militants. A French soldier battles Islamist fighters in Gao, Mali on Thursday, Feb. 21, 2013. President Obama has told Congress the last of about 100 troops has arrived in Niger, where they'll assist French troops with intelligence work. 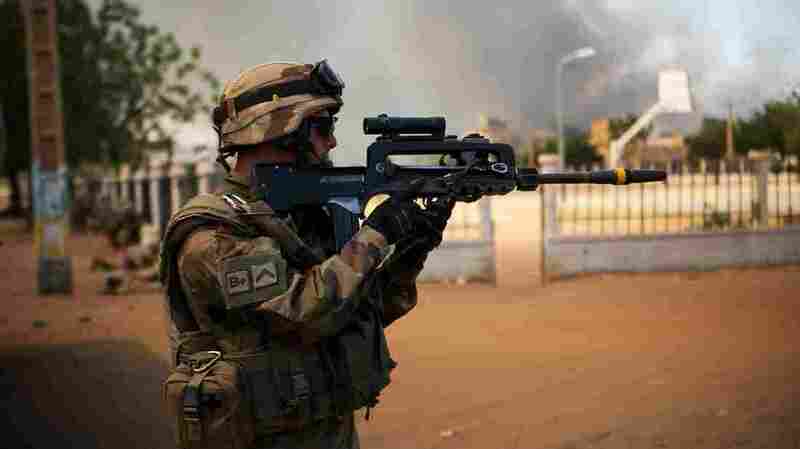 France has an ongoing military operation in neighboring Mali, where troops are pushing out Islamist militants. Niger has agreed to allow the U.S. to station surveillance drones in that country, according to Reuters. The Associated Press reports Obama told lawmakers that U.S. troops are there with weapons "for the purpose of providing their own force protection and security." But the Islamist fighters in Mali may be prepared for any use of drones. The AP discovered a "Xeroxed copy" of a document they left behind in Timbuktu that listed 22 ways to avoid drone detection, such as putting mats on the top of cars: "The tips in the document range from the broad (No. 7, hide from being directly or indirectly spotted, especially at night) to the specific (No 18, formation of fake gatherings, for example by using dolls and statues placed outside false ditches to mislead the enemy.) The use of the mats appears to be a West African twist on No. 3, which advises camouflaging the tops of cars and the roofs of buildings, possibly by spreading reflective glass." These may also be good advice on how to evade detection from French warplanes; it could account for reports that hundreds of Islamist fighters were able to fade away from Malian towns without drawing the attention of French troops.